The latest episode of the podcast series on ‘Nostalgia’, hosted by Dr Chris Deacy, Reader in Theology and Religious Studies in the Department of Religious Studies, has just been released. 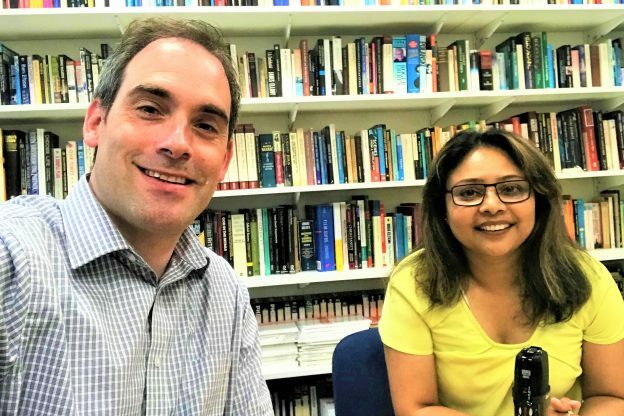 In this week’s interview, Chris interviews Dr Reshmi Dutta-Flanders, Honorary Research Fellow for the Department of English Language & Linguistics. Reshmi grew up in Calcutta and came to the UK to study English at King’s College London in 1989. In this fascinating conversation, Reshmi compares her experiences of previously studying literature in India and how she was able to acquire various research skills. Reshmi talks about the influence of her aspirational parents. Her father was a survivor of the Partition, and ended up doing an Engineering Degree in Wolverhampton. She also discusses her own experience of an arranged marriage, and we learn that her mother has just written a book, at the age of 80, in the field of Religious Studies. Reshmi has often felt a need to prove something to herself, and has often felt a sense of dissatisfaction and never really felt a sense of belonging. She discusses how fear has often prompted her to push herself forward, and we talk about the degree to which education can be seen as an enjoyable pursuit and how it might be possible to enjoy what one is doing in the moment without worrying unduly about the future. In the final part of the interview, Reshmi speaks candidly about her experience of teaching in Category B and C prisons where her students were often inveterate and institutionalized prisoners. This entry was posted in Campus online on 13 September 2018 by Wendy Raeside.